They began trickling into Baton Rouge, La., in the spring of 2012. By 2014, the trickle had become a tsunami. But while almost all the scouts who watched Aaron Nola in college agreed he would someday pitch in the major leagues, the prevailing opinion was that he profiled as, at best, a middle-of-the-rotation starter. "I kept kind of smirking when I'd hear that," said Mainieri, who recruited Nola, now the ace of the Phillies staff, to Louisiana State University, put him in the starting rotation as a true freshman and watched him develop into one of the best amateur pitchers in the country. "If you want to put him on a team with Clayton Kershaw or two guys like that, then maybe he'll be a third starter. But I would never put anything past Aaron Nola." Sure enough, four years into his major-league career, Nola is an honest-to-goodness ace. Through Thursday morning, the 25-year-old righthander leads National League pitchers in wins (12) and wins above replacement (5.6, as calculated by Baseball-Reference.com). He ranks second in ERA (2.27) and third in innings (123) and walks/hits per inning pitched (0.984). He has allowed the fewest home runs per nine innings (0.439) and posted the third-best fielding independent pitching (2.62), a measurement of a pitcher's effectiveness at preventing homers, walks and hit by pitches and causing strikeouts. And next week, Nola will be the Phillies' lone representative at the All-Star Game in Washington. So much for the scouts' projections. "We knew he would be a solid major-league pitcher, but we viewed his ceiling as probably a [No.] 3 or a 4, really, in retrospect," former Phillies general manager Ruben Amaro Jr. said. "But his makeup and the way he goes about his business — and his ability to adapt and adjust, as you see over the last year or year and a half — it's probably elevated him to that higher level. I'm particularly pleased to have seen that development." Indeed, it is Nola's knack for making adjustments, particularly with his offspeed stuff, that has put him among baseball's elite. Nola is known for his dirt-diving, bending curveball. It's one of the best breaking pitches in the majors — right up there with the hammers thrown by Houston Astros starters Lance McCullers Jr. and Charlie Morton, Cleveland Indians righthander Trevor Bauer, and Los Angeles Dodgers lefty Rich Hill — and he uses it liberally, roughly 30 percent of the time. But within the past year, Nola has leaned more heavily on his change-up. In college, he favored the change-up over his signature curveball, according to Mainieri and LSU pitching coach Alan Dunn. Nola's realization that he must go back to that pitch and his confidence in throwing it in big situations might be the single biggest factor in his growth from a promising young pitcher to an all-star and the latest in a line of contemporary Phillies aces that has included Curt Schilling, Cole Hamels, Cliff Lee, and Roy Halladay. "I think a starting pitcher nowadays needs to have three pitches," said Nola, who speaks so softly that it seems as though he might fall asleep before he completes a sentence. "In 2017, going into spring training, that's what I really focused on, trying to throw that change-up and trying to get really consistent with it, throwing it for strikes. And I did. It's just something, a pitch that I can continuously get better at each year, and I think it's definitely made a difference for me." As difficult as it is to believe for anyone whose introduction to Nola has come since his major-league debut for the Phillies on July 21, 2015, his change-up was further developed than his curveball when he showed up on LSU's campus in 2012. Mainieri had only recently hired Dunn, who brought 22 years of experience as a pitching coach in pro ball. And Dunn marveled at Nola's knack for putting his fastball exactly where he wanted it, so much so that he walked only seven batters in 89 2/3 innings as a freshman. Aaron Nola pitching for LSU against Mississippi State in May 2012. But a starting pitcher can't live on a heater alone, especially one that sits in only the low-90s. As Dunn recalled, Nola "felt really comfortable" with his change-up coming out of high school, so they went to work on developing his curveball. Dunn wanted him to throw it harder and command it as precisely as his fastball. The best way to do that was to throw it a lot, even at the expense of the change-up. "I started throwing my curveball more my second year," Nola said. "It got better. I was getting guys out more. I still had my change-up, but I hadn't thrown it as much. I think my curveball had more conviction at that time. I kind of went to fastball as my number one [pitch], curveball as my number two, change-up as my number three." Said Dunn: "I think he lost a little bit of the feel for his change-up. During his time here, the fastball/breaking ball became those go-to pitches, and the change-up was just kind of the third pitch. That's kind of how we pitched with his time here." It worked. Nola went 12-1 with a 1.57 ERA, 122 strikeouts and 18 walks in 126 innings as a sophomore. As a junior, he went 11-1 with a 1.47 ERA, 134 strikeouts and 27 walks in 116 1/3 innings and became the only repeat winner of the Southeastern Conference's Pitcher of the Year award. The Phillies selected Nola with the seventh overall pick in the 2014 draft and signed him for the slot value of $3.3 million. They needed to begin replenishing their starting pitching in the years after Lee and Halladay left the organization, and as Amaro recalled, "we knew that [Nola] would be a major-league pitcher in a very short period of time." All it took was 12 months. Aaron Nola will be the Phillies’ lone representative in the All-Star Game next week in Washington. But Nola was not yet a finished product when he got to pro ball. For one thing, the seams on a minor-league baseball were different than on an NCAA ball. And although it didn't adversely affect Nola's change-up grip, which he altered slightly in his junior year at Dunn's suggestion, it did force him to change how he positioned his fingers when throwing the curveball. "When I first got to the minor leagues, my curveball was kind of not coming out as sharp, not as good," Nola said. "I still threw it the same way [as in college] with my fingers, but the seams were a little smaller, a little lower, so it didn't come out as sharp. I still threw the same change-up, so it went back to fastball, change-up [as the secondary pitch], curveball." But Nola ultimately had to put his change-up aside once again to work on his breaking pitch. He traded the two-finger grip taught to him by Dunn for one in which he dug his index finger into the ball and spiked it toward the ground to get more downward movement. The new curveball played off his sinking fastball and provided a different action with a similar look coming out of his hand. It became such a good pitch that Nola threw it 24.4 percent of the time in 2015 after making his major-league debut and 33.8 percent of the time in 2016, according to MLB Statcast. 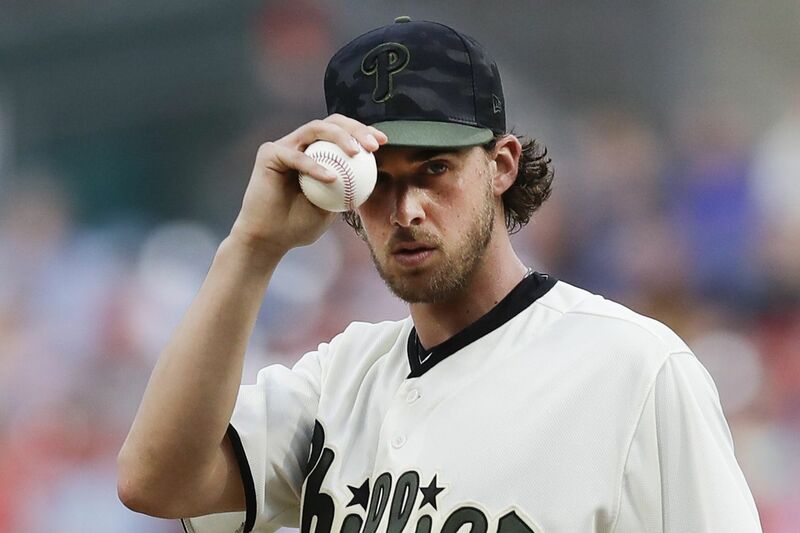 >>READ MORE: Aaron Nola is eligible to play in the All-Star Game. Could he start? All along, though, Nola knew he would have to reincorporate his change-up, which had gotten a little rusty for his liking. In 2016, as he was still getting comfortable in the majors and dealing with an elbow injury that cut short his first full big-league season, he threw it only 8.4 percent of the time, a usage pattern that needed to change in 2017 as opponents saw him for a second, third and fourth time. "He got that good curveball later in his college career and really stepped it up when he got to pro ball when he learned to spin it the right way," said Austin Nola, Aaron's older brother and a triple-A catcher with the Miami Marlins. "But I think what happened was he got away from the change-up. The last couple years, he's really started to work on it and get that back." It began in spring training of 2017, Aaron Nola said, when he went back to a slightly modified version of the change-up grip that he used in high school and as a freshman at LSU. Really, though, it was a matter of committing to the pitch. Nola really started making that commitment midway through last season. In 36 starts since June 22, 2017, he has averaged 18.67 change-ups per start, according to Statcast, an increase over 9.62 change-ups per start through his first 42 career starts. It's hardly coincidental that he has a 2.70 ERA in his last 36 starts compared to a 4.39 ERA in his first 42. "The [change-up] isn't a brand-new pitch, but the way he's using it, with as much confidence as he is, he can throw it in any count to a righty or a lefty and it's a real good change of pace," Phillies manager Gabe Kapler said. "You have two really 'plus' pitches in the curveball and the change-up, which makes that fastball even more effective." Force Nola to rank his pitches now and he will say it depends on the day. One thing is clear: For the first time in his career, he's truly a three-pitch pitcher. Aaron Nola’s change-up has become a powerful pitch for the righthander. In 60 starts before this season, he threw 20 or more change-ups in only six of them. This season, he has thrown 20 or more change-ups in 10 of his 18 starts. He even used the pitch to set the tone in a seven-inning, one-hit gem Monday night against the New York Mets, striking out the first three batters on change-ups. "If you add a third element, a third wrinkle, even if he's not throwing it for strikes per se, it just puts it in the back of the other team's mind," Phillies left fielder Rhys Hoskins said. "The third pitch, it just opens up the rest of his arsenal." Hoskins has played behind Nola long enough that he doesn't need to be convinced of the ace's talent. It was reinforced, though, when he was on the disabled list in early June. To preserve his timing at the plate, Hoskins stood in on a few of Nola's between-starts bullpen sessions. "Just to watch the perfection that happened in his bullpens, there's a lot more appreciation for what he does every time he steps on the mound," Hoskins said. "Every spot was hit. Everything was sharp. There were no misses in the middle of the plate. That's why he's an all-star." It's also what Mainieri kept telling the talent evaluators who underestimated Nola's potential. Mainieri used to text Nola after every start, a ritual that he said has become less frequent because "it would just get redundant for me to say, 'Hey, way to go. Nice game.' " But Mainieri had a more pointed message before Nola's major-league debut when he texted old friend Andy MacPhail, the Phillies' team president. "I just wrote, 'I just want you to know that you may not realize how special this kid is, but you will find out in a very short time,' " Mainieri recalled. "He's seen a gazillion ballplayers, and I'm sure he's heard that a lot. But I honestly felt that way. I think everybody in Philadelphia is starting to understand why I felt this kid was so special."